Who is Voiles en Voiles for? 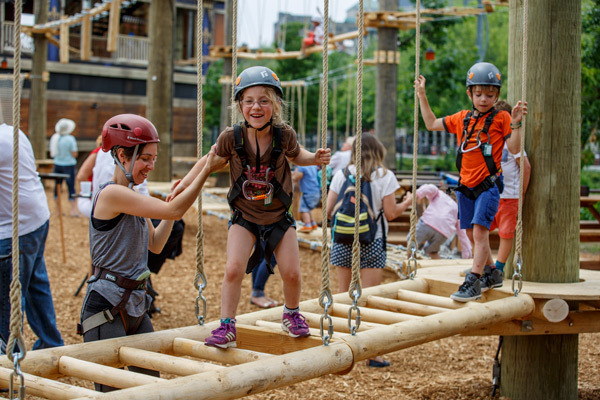 The park has been designed to entertain both families with children and adults that love intense experiences. 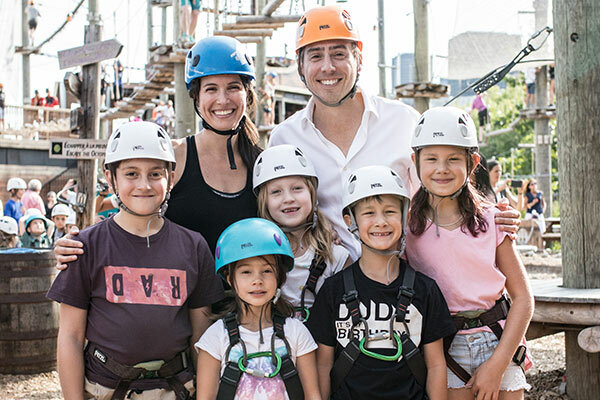 With courses at different heights and difficulty levels, we are proud to offer an experience that’s fun for adults and children alike! 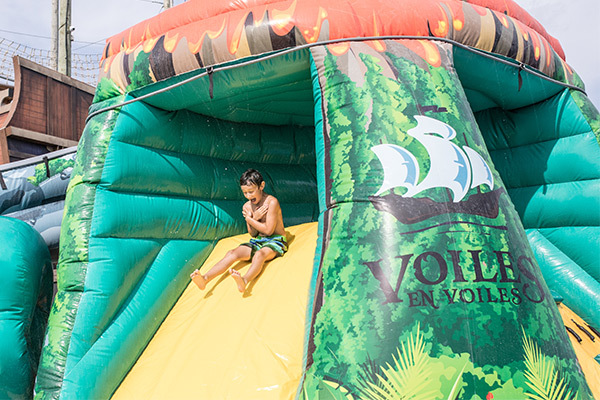 Voiles en Voiles offers a whole range of activities to entertain children and adults alike. See for yourself all you can at Voiles en Voiles. 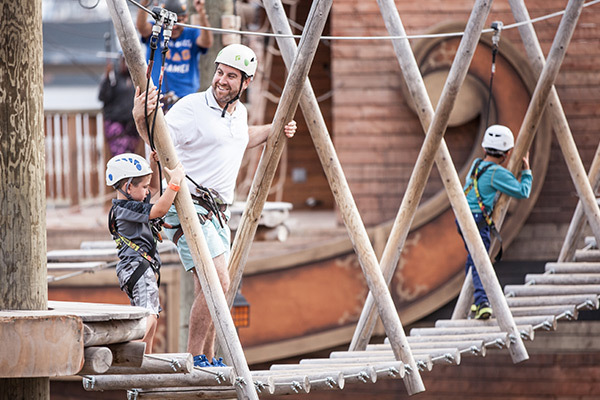 Specially designed for toddlers, the "Escape the Octopus" course allows children to get used to the harness and the games. Will they be able to escape the octopus? 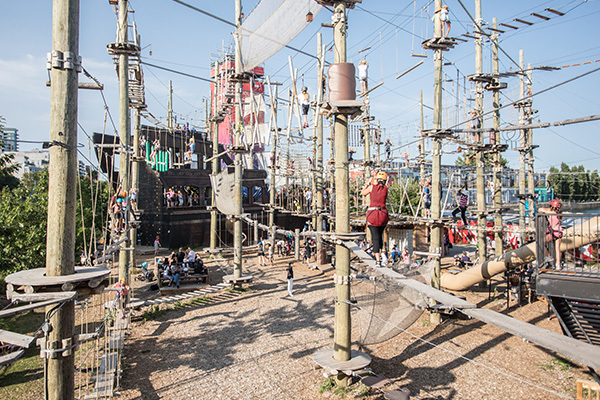 The start of the aerial course is on the ground and parents can accompany their children. Hanging ladders, flat nets, rocking bridge, footbridge and more. Recommended for children between 3 to 6 years. No minimum height. 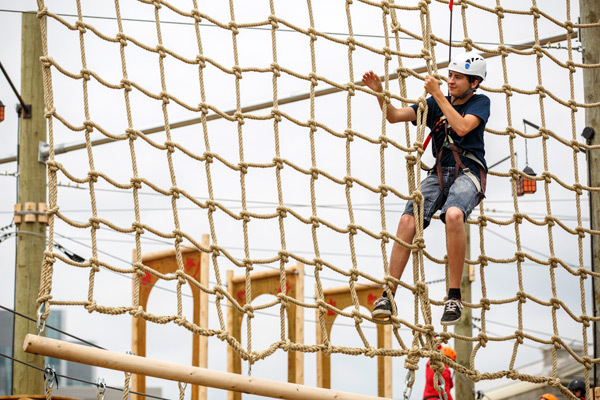 You have been accused of Mutiny aboard the pirate ship and you are forced to "walk the plank"! 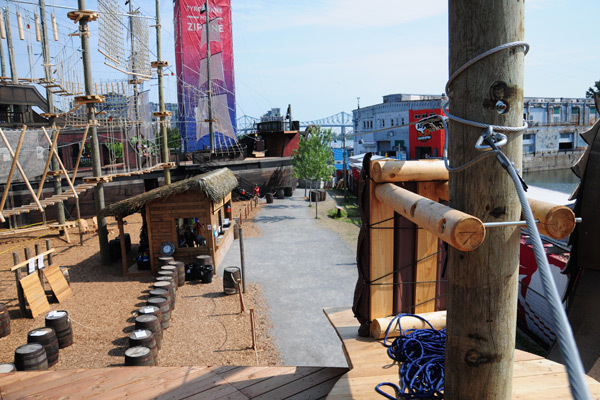 The start of the course is on the deck of the pirate ship. Alternating logs, bridge, footbridge, maze and more. Recommended 5 years and up. Children under 5 must have completed the "Escape the Octopus" course and be accompanied by an adult. You are a member of the royal guard and you are given a mission to spy on these evil pirates! The start of the course is on the deck of the royal ship. 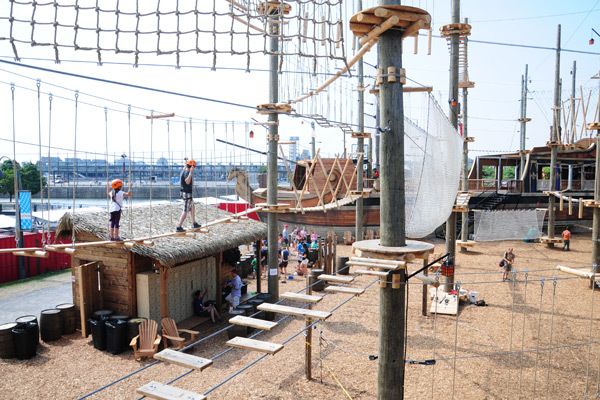 Log passage, climbing wall, monkey bridge, swings and more. 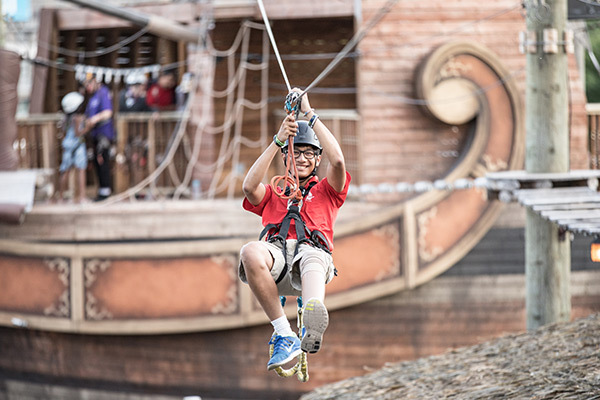 As head of the royal guard, you are given a mission to sabotage the sails of the pirate ship! Will you be able to complete the mission and return to the royal ship? 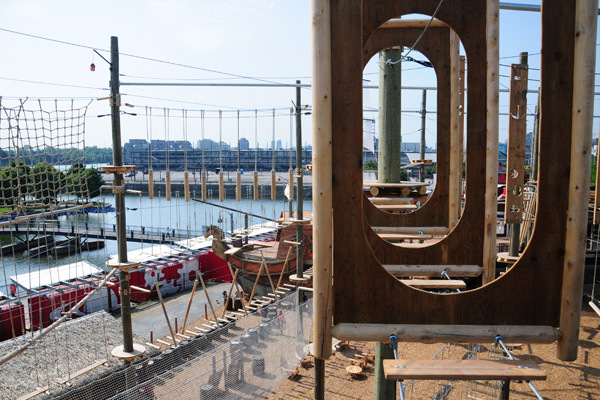 The start of the course is at the top of the pirate ship. Passing of the bags, hanging logs, small ropes, crossing net and more. Recommended 7 years and up. Children under 5 must have completed either "Mutiny" or "Scouting Mission" and be accompanied by an adult. The fiercest of all opponents at Voiles en Voiles, Captain Red Beard is perched on top of the masts. Will you have the courage to face him? Hanging logs, hanging nets, surprise fotbridge, hanging beams and more. Recommended 10 years and up. Children under 5 must have completed "Sabotage Mission" and be accompanied by an adult. Will you go all aboard and throw yourself in the air to attack the rival's ship? Attack the enemies' ship at 20 feet high with a 48 meters slope! All aboard the royal or the pirate ship! 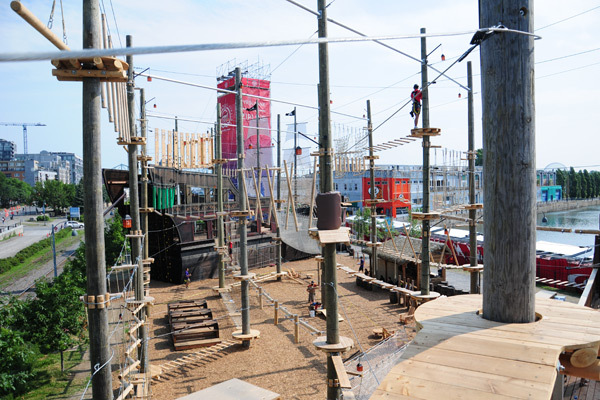 Climb the wall of the pirate ship to the summit using one of four paths. Climb up and attack the pirate ship! 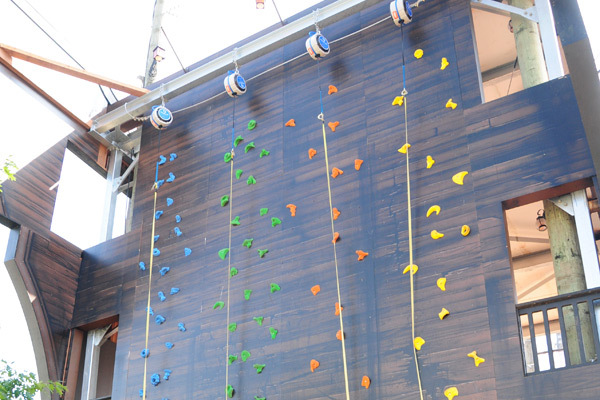 4 courses of varying difficulty for beginners and experts. 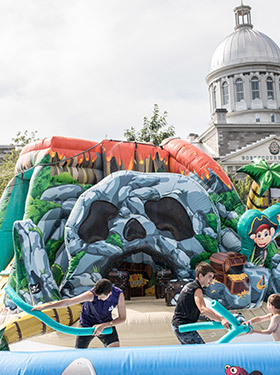 Stay in our world of royalty and piracy by jumping into our themed inflatable games. 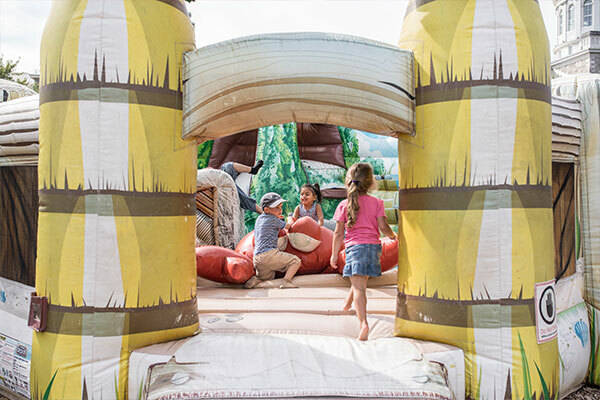 Jump and slide in our inflatables games. 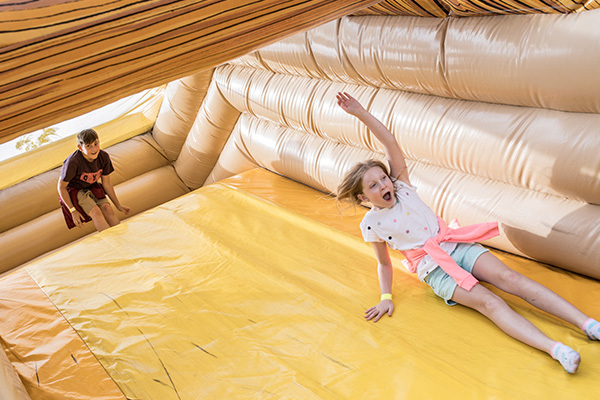 Slides, climbing wall, obstacle courses, bouncy house and more. Recommended 2 years and up. 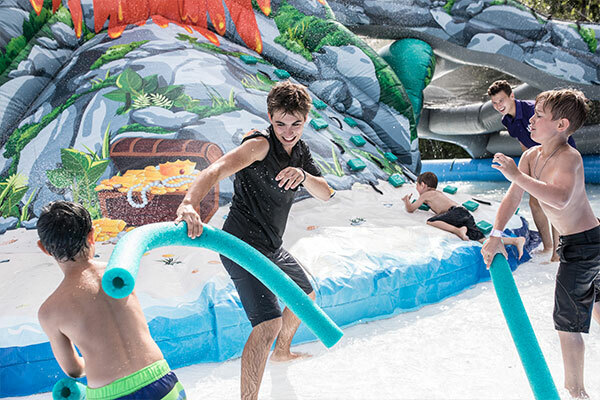 Refresh yourself in our water thematic inflatable games. No need for a swimsuit! 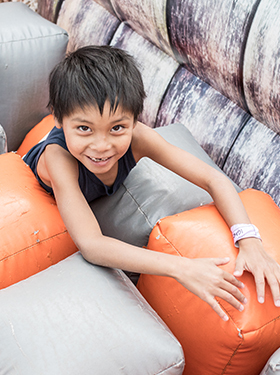 Jump, swim and slide in our thematic inflatable games. 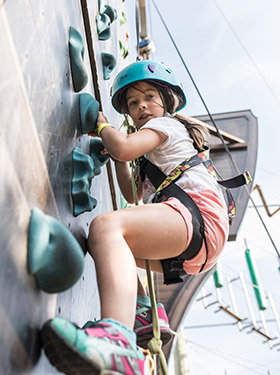 Water pools, slides, climbing wall, obstacle courses, jumpers and more. We have courses suitable for all ages and our system is safe even for small children.. However, because of the difficulty of some routes, it is strongly recommended to go gradually. A child under 5 years old must begin by the "Escape the Octopus" course at 2 feet. 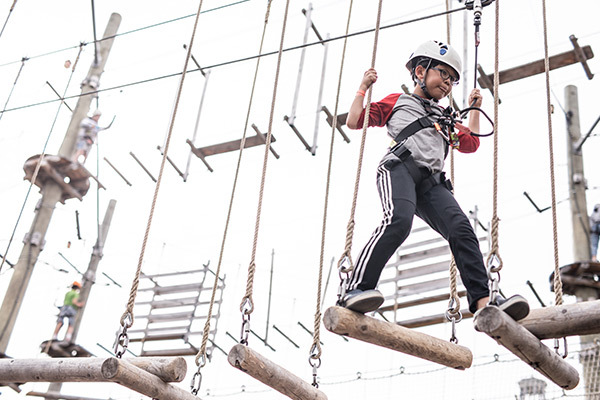 A child under 10 years old must be accompanied by an adult for the course at 35 feet. Recommended for children 5 years old or more. Recommended for children 2 years old or more. 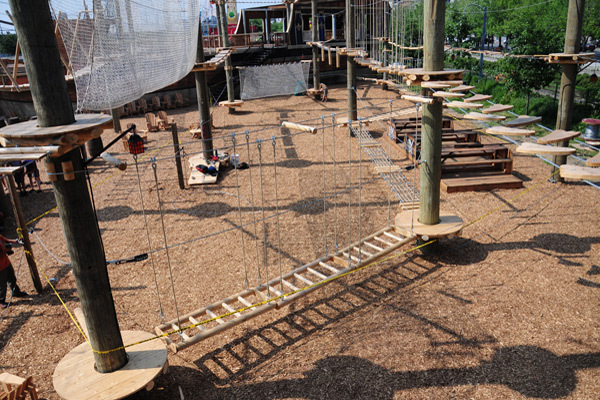 That being said, every child is different and we even had a 5 year old girl do the 35 feet high course and have fun. Just go gradually..
For reasons of security and given the limits imposed by engineering and the equipment, the maximum weight is 250 pounds for air routes. 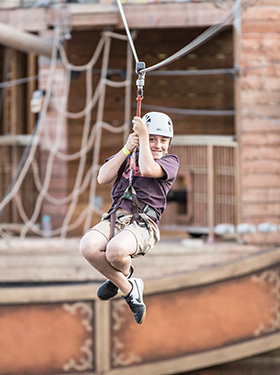 Do I have to accompany my child in the aerial courses? If not, do I have to pay? 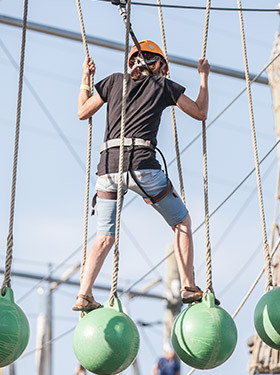 Access to the site and the ships is free, you only pay for participating in the activities. So you can relax in our Adirondack chairs, on our picnic tables or on the boats while watching your kids, for free. 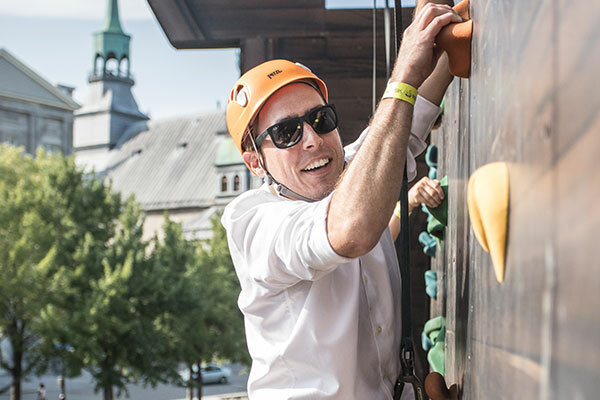 However, depending on the age of children, some activities might require the support of an adult. 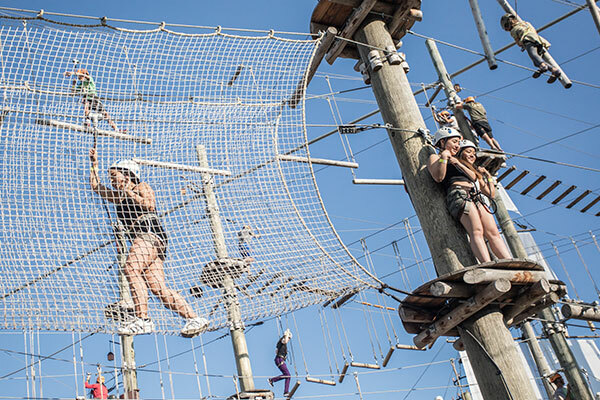 For more details, please read the answer to the question: "Is there a minimum age or height for aerial courses?" No. We only take reservations for kids birthday parties or for groups of more than 15 persons. Otherwise, just come and see us!